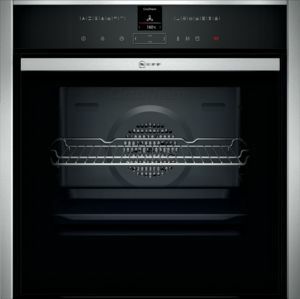 Neff Built In Slide And Hide Single Ecoclean Oven With Vario Steam – Stainless Steel. This model is the Neff B47VR32N0B Premium, Slide and Hide stainless steel steam combi oven. This is designed to be fitted into a 600mm Eye level or base housing. The oven has 12 cooking functions, Neff Small TFT controls and a self-cleaning liners cleaning system. The oven capacity is 71 litres. This model has a total connected load of 3.45kw and a 16amp fuse rating. The oven comes with a 2year parts and 2year labour warranty. Slide and Hide – Our unique Slide and Hide door fits smoothly under the oven to give plenty of room, as well as better access to the ovens interior – ensuring an easy and flexible approach to cooking. CircoTherm – Circotherm draws air in from the oven via a powerful fan, heats up the air and forces it back into the cavity via strategically placed ducts in the rear wall. A complete 3 course meal can be cooked at the same time on three shelf levels with out flavours intermingling. CircoTherm gives you 3 cooking levels. Shift Control – Is ideal for cooks who prefer the convenience of a traditional rocker switch. Our large and medium TFT screens feature a colour display for even easier operation. Baking and Roasting Assistant – This innovative assistant makes preparing a variety of dishes even easier and more convenient. For each one, the Baking and Roasting Assistant serves up a cooking suggestion at the touch of a button. It also recommends the ideal heating mode, temperature and time, to ensure perfect results. The Baking and Roasting Assistant keeps you informed of the time remaining. Naturally, you can change all of the suggestions to give dishes a personal touch. Hot Air – The fan draws air from the interior of the oven, then heats it up and forces it back into the cavity to ensure even heat distribution. CircoTherm Eco – Optimised for cooking and baking on one level only for maximum energy efficiency. Opting for this setting saves 30% energy when compared to the maximum consumption allowed for A rated models, perfect for frozen or convenience foods, bread, cakes and meat. Top and Bottom Heat – Providing conventional cooking heat sources at the top and bottom of the oven. Heat travels to the centre of the oven by natural conduction. Ideal for baking pastries and scones. Conventional Heat Eco – This setting heats the centre of the oven for single shelf cooking. The oven maintains the average temperature in a more economical way by cutting out the on/off thermostat so the oven cooks on residual heat. Circo Roasting – An ideal function for cooking meat and poultry if you require a rotisserie result. The grill and fan distribute heat alternately reducing cooking times by 35-40%. Full Surface Grill – The grill element is situated in the oven roof. It is thermostatically controlled and will cycle on and off to maintain the required temperature. Centre Surface Grill – You can use just the centre section of the grill for smaller quantities. Bread Baking – Bread baking temperature varies between 180 deg C and 220 deg C. Ideally suited to baking crusty bread with an open texture. Up to three levels of bread can be baked at the same time. Bottom Heat – Providing heat from the bottom of the oven, for more focused heat and control. This method is ideal for pizza bases and pastry cases where you need a crispy underside or bain marie and casseroles. Keep Warm – An ideal setting for keeping food warm without drying it out before serving. Typically set between 66 deg C to 100 deg C .
CircoTherm Intensive – Uses a combination of CircoTherm and bottom heat, ideal for foods that need a crispy underside like pizzas, or speciality breads. It can also be used for one stage pastry such as lemon meringue pie, eliminating the need for blind baking. EcoClean – The patented Neff EcoClean system is a microfine ceramic bead coating on the ovens top, sides and back. It has a very large surface area, making it extremely absorbent. It absorbs fat droplets and keeps the inside of the oven clean. BaseClean – BaseClean helps clean the bottom of the oven by softening dirt with warm water. After the programme has finished you just have to wipe the base with a damp cloth. Oven Cleaning – A special electronic setting designed to keep CeramiClean surfaces inside the oven as clean as possible. Used on a regular basis, it can keep your oven interior lining remarkably clean with minimal maintenance required. Descaling – All Neff compact steam appliances contain a descaling programme which can be set according to the hardness of your water for optimum results. Reheat – Reheat gives the opportunity to gently warm dishes again – and thanks to the moisture in the oven, they will look and taste freshly prepared. PowerBoost – The PowerBoost function speeds things up even more when coking for short periods of time – just put the food in and start the oven. Automatic Programmes – Take the guesswork away with auto programmes, designed to cook or defrost your food at the touch of a button. Sabbath Setting – Oven is automatically set to conventional heat at a temperature of 85 – 140 degrees C. You can adjust the Sabbath setting duration for between 24 to 73 hours. We are an Appliance Deal Specialist for NEFF, AEG, ELECTROLUX and ZANUSSI appliances, which means we can secure the best price on any appliance for you today. If you would like a best price deal on a appliance simply choose your appliance or appliances put them into our i-price quote engine and we will give you today’s best price for your appliances, delivered to your door, it couldn’t be simpler. Click Here to Get Started. We pride ourselves on knowing each and every product inside out and with that wealth of experience we are able to advise you on the best appliance solutions for you. Talk to us; talking to us means you can have access to expert advice and the most competitive pricing. We can often beat market prices due to our relationships with manufactures and suppliers, let us know what you need and let us see what we can do for you. For the best pricing and a better all-round service contact us today. and Save Even More Money.